Here are some activities designed to be fun for both you and your toddler as well as to help your young child (ages 1 to 3) gain the skills needed to get ready for school. The activities below are designed to help you prepare your toddler (1-, 2- and 3-year olds) to learn and develop. Most of the activities are simple and easily can be made part of your daily routines. As you do the activities, remember that repetition is important, especially for very young children. Children enjoy — and learn from — doing the same activity over and over. Let your child feel the items that you buy — a cold carton of milk, for example or the skin of an orange. Talk to your child about the items: "The skin of the orange is rough and bumpy. Here, you feel it." Box car. Give your child a large cardboard box to push around the room. He may want to take his stuffed animal or toy for a ride in it. If the box isn't too high, you'll most likely find your toddler in the box as well. Make singing a natural part of your daily routine — let your child hear you sing as you work around the house or sing along with songs on the radio or TV or with your own CDs or recordings. Encourage him to join in. The single most important way for children to develop the knowledge they need to become successful readers later on is for you to read aloud to them often — beginning when they are babies. Keep in mind that children don't always learn the same things at the same rate. And they don't suddenly stop doing one thing and start doing another just because they are a little older. So use the ages as guides as your child learns and grows and not as hard and fast rules. For example, an activity listed for the toddler age group may work well with a baby. On the other hand, the activity may not interest another child until he becomes a preschooler. For a list of expected accomplishments by age, see Young Children's Development: What to Expect. More activities for Babies and Preschoolers can be found here. Honig, Alice S. (1982). Playtime Learning Games for Young Children. Syracuse, NY: Syracuse University Press. Krueger, Caryl Waller. (1999). 1001 Things to Do With Your Kids. New York: Galahad Books. Miller, Karen. (1985). More Things to Do With Toddlers and Twos. Chelsea, MA: Telshare Publishing Co.
Simon, Sarina. (1996). 101 Amusing Ways to Develop Your Child's Thinking Skills and Creativity. New York: Lowell House. Texas Center for Reading and Language Arts. (2001). Activities to Implement the Prekindergarten Curriculum Guidelines. Austin. Texas Reading Initiative. (1998). Beginning Reading Instruction: Practical Ideas for Parents. Austin: Texas Education Agency. Warner, Sally. (1991). 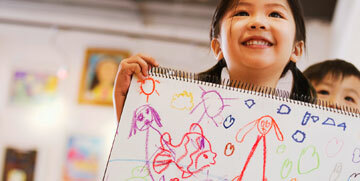 Encouraging the Artist in Your Child. New York: St. Martin's Press.